The masterful design by the distinguished Rob Humphreys is luxuriously appointed, the semi deck saloon opens out into a virtual apartment with superb voluminous space and the overhead and side panoramic windows provide welcoming natural light and an excellent view. The selection of various interior layouts with up to 5 beautifully appointed cabins and large en-suite bathrooms, as well as an office offer the owner the possibility to custom design to his requirements. The push of a button opens the garage door which serves as a large swimming platform when fully opened creating easy access to the water and additional entertainment area. 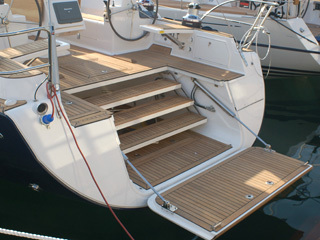 Designated garage space stores an inflatable tender up to 2.60 metres in length and optional retractable hydraulic gangway eases the access on and off the yacht.